It was with my perfectionism-reducing agenda in mind that I set out recently to make a ceramic tray for a lotion dispenser. I had a rough notion of what I wanted to do, but didn’t take any measurements or create a template for the project. My idea was to craft a rectangular tile with a circular indentation at one end for the base of the bottle to sit in, while the spout perched over the tray so any drips would wind up on the lotion stand and not on the bathroom counter. It didn’t need to be perfect, just functional. I knew exactly what needed to be done and confidently set about doing it. The clay had a different notion. Oh, I rolled out two slabs just fine, cut a circle in one, stacked them one atop the other to form a single thick tile with an indentation, and worked the clay to make sure it adhered properly. But when I cut it into a rectangle, forcing the clay to conform to my rigid specification for shape, everything started to go wonky. The sides tilted all over the place and the circle started to collapse after shifting into something, well, not circular. The clay was telling me to let go, to allow it to take the lead, and after struggling for half an hour, I gave in to it. “OK, you win,” I admitted, balling up the mess and starting over. The result was wonderful. This time, the clay cooperated. The work went quickly and was almost effortless. When time came to form the final shape, I knew better than to impose my ideas; instead, I let my hand flow to create a rough oval, something rather resembling a peanut. Without conscious thought, I scored an uneven crosshatch design into the surface with a potter’s needle to complete the unplanned aspect of it. 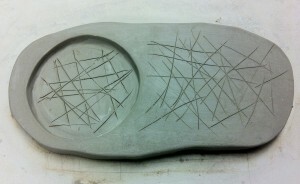 My tray blew up in the kiln. Yep, it exploded into a million little pieces — well, maybe not a million, but it’s a catchy phrase, eh? That had never happened to me before. Surely some deep symbolism must be at play here. What could it mean, that the first time I really, truly let go and didn’t strive for perfection was also the first time my work was utterly destroyed? I don’t know, and have no intention of over-thinking it. I’m just going to remember how it felt to create with abandon, confident enough in my abilities to follow my instincts rather than second-guessing them, and try to do that more often. Instead of always striving for my work to be perfect, sometimes I’ll accept it as perfectly imperfect — for that may be the most satisfying kind of perfection there is. This entry was posted in - Musings and tagged alliteration, clay, letting go, M.P. Witwer, perfectionism by Select Stories. Bookmark the permalink.